Pha Sing Liao The district of Hod. 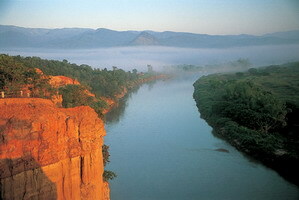 It is located at Ban Mai Mai Phana, Moo 10, Tambon Ban Tan, Hod District, Chiang Mai Province. Pha Sing Liao is the Cliffs. A hole is a ravine And a cliff like a lion head turned to the side. And similar as Pae Mueng Pee. People are interested to visit. Pha Sing Liao is a natural phenomenon (geology). The land subsidence caused the cracks of the rock layers alternately and beautiful. Legend has it that even the Lion King also looked to the beauty of this cliff. "Pha Sing Liao" a pillar of the soil to be highest in the country. Because the tallest column is 50 meters high. The area is almost 100 rai. The soil is dirt column at Sing Liao is the same as Pae Mueng Pee is dirt. The pole was clamped with clay, gravel, stone. The soil column at Leo Liao is a variety of shapes. Imagine making many possibilities. It is similar to the 30 meter high Roman wall or the tallest in the country. The location surrounded by dense forest makes this monolithic garden look better than many other places. Especially if traveling in the foreat change color. (January), the forest will change color and beautiful pillars together. Travel Travel by car. By Highway 1103 (Hod Road - Doi Tao). Away from Hod, approximately 18 kilometers. There are periodic signposts.